For quality over quantity, look no further than West Feliciana. Here are three ways to set a stand on some of Louisiana’s most exclusive hunting territory. With patient management on most of the private land in the area and plenty of food, it is no surprise that West Feliciana and neighboring parishes are home to some serious bucks. Opportunities to harvest these big deer come in two ways: by spending time on the many public lands in the region or by leasing or purchasing private land. Outfitters are rare in the region as are commercial hunting lodges. However, with patience and hard work, public and private land hunting can pay off. Public lands abound in Louisiana. A number of federal and state agencies offer millions of acres to hunt, fish and enjoy. Cat Island National Wildlife Refuge, managed by U.S. Fish and Wildlife Service, is inundated the Mississippi several months out of the year but is generally accessible by vehicle and boat during the early months of deer season. Recent floods have damaged roadways into the refuge, forcing the closure of the refuge until further notice. Refuge volunteers suggest that interested hunters follow the Volunteer group’s Facebook page in order to stay aware of the conditions at the refuge. West of the river, in the poorly drained bottom lands of the Mississippi Delta, Avoyelles Parish and Concordia Parish offer several federal properties to hunt — Grand Cote National Wildlife Refuge and Lake Ophelia National Wildlife Refuge. Grand Cote is located west of Marksville and is bisected by LA Highway 1194. Area deer take advantage of the refuge’s proximity to nearby agricultural fields where they feed on soybeans and other crops. Early season bowhunters favor edges around the refuge. 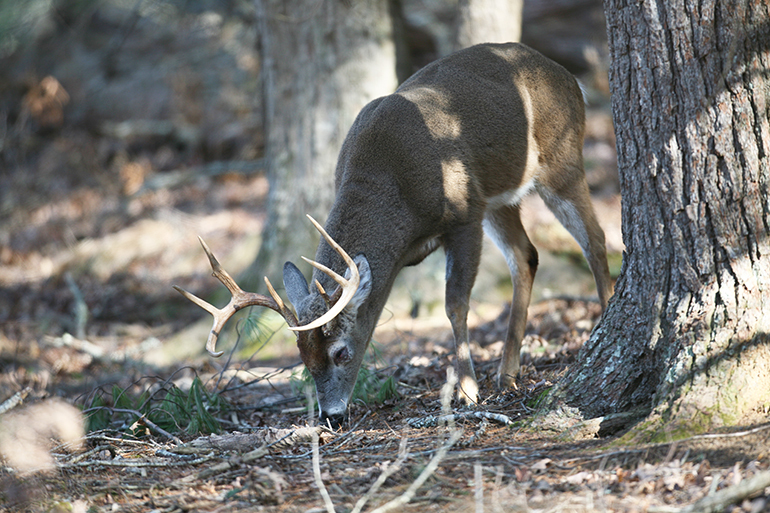 Hunting the rut later in the season requires more strategy, but offers chances at bucks as they stay on the move. Lake Ophelia NWR, also managed by the USFW, has produced several 150- to 170-inch studs over the last several years. Hunting on the refuge is intense as the next deer a hunter sees could be a trophy. Today, deer populations on the refuge are closely monitored. Refuge staff collects life history data from harvested deer during hunting season and conduct browse surveys during the spring. Tunica Hills WMA is composed of two tracts, both managed by the LDWF. The North Tract (2,346 acres) is immediately adjacent to the Louisiana State Penitentiary, while the South Tract (4,156 acres) is found off Old Tunica Road. “Both tracts that make up Tunica Hills have been very productive and are quite popular with bowhunters,” said Bordelon. The WMA lies at the southern end of the “loess blufflands” escarpment that follows the east bank of the Mississippi River. These blufflands offer a diverse and unique habitat that supports some species of plants and animals not found elsewhere in Louisiana. The terrain is characterized by rugged hills giving way to ravines, while the forest community on the area is classified as upland hardwood with some loblolly pine and eastern red cedar mixed in on the ridgetops and creek terraces. Access points, parking areas and self-clearing permit stations are located at several locations across the WMA. Across the river, Concordia Parish and Avoyelles Parish, offer thousands of acres of public land on several highly productive WMAs and federal refuges. The habitat is much different on the west side of the river. High blufflands are replaced with large tracts of bottomland hardwood forests, bayous, creeks and sloughs. This habitat has produced many of Louisiana’s biggest bucks. Spring Bayou WMA, Pomme De Terre WMA and Richard K. Yancey are accessible for bowhunters but also support multiple rifle and primitive weapons hunts into December and January. Hunting west of the Mississippi River is a bit different than in the loess-soils on the east side of the river. Information regarding Louisiana’s WMAs, including maps, special seasons and other information, can be accessed by visiting wlf.louisiana.gov. Using the ArcGIS Louisiana Outdoor Explorer tool, interested hunters can access interactive maps and high-quality images of WMAs. Owning and managing a parcel of land in this buck-producing region may be a bit tricky. Shirley says land near $5,000 per acre would be considered the low end of the market, and small parcels don’t go up for sale all that often. If they do, they don’t last long with a broker. Whitetail Properties LLC focuses on hunting and recreation land all across the country. The local office is located in Baton Rouge. Just to the west, an interested hunter can find access to more accessible land. Hunters looking for opportunities to join a club or obtain a lease should start by visiting local social media groups. Most often, leases come available during the beginning of summer, and a quick search for “Louisiana Hunting Leases” returns several options. Also, interested hunters or groups of hunters can follow postings on sites like huntingleasenetwork.com or follow advertised land leases on sites like craigslist.com. Some of the benefits of leasing land, instead of owning include having the flexibility to leave if the land becomes less productive than anticipated. Also, not paying taxes on land is an added benefit. Many clubs also offer shared resources like tractors, implements, trucks, coolers, etc., that can be shared by all members. 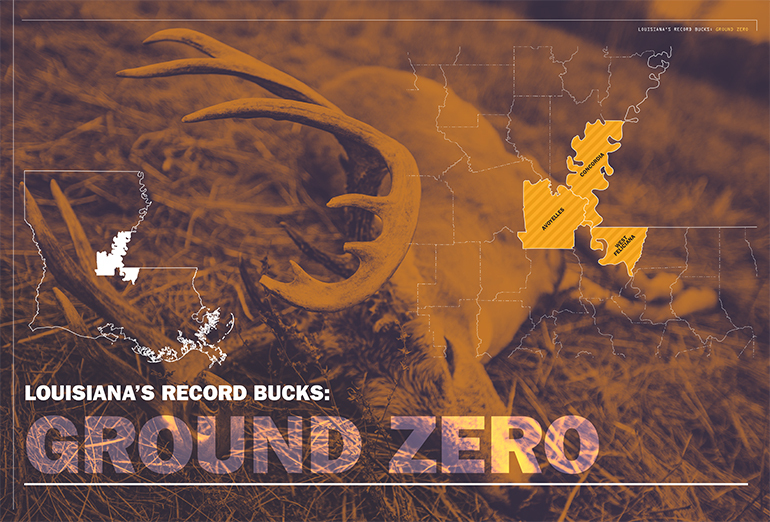 Ground Zero for big bucks in Louisiana encompasses highly productive habitat on both sides of the river. Continued science-based management on public and private land will continue to support deer populations complete with trophy bucks. With many public lands available as well as opportunities to buy or lease lands, its no wonder why sportsmen from all over flock to the region. Tunica hills supports a healthy deer herd. However, the ridges and valleys of the WMA and the area’s oaks and hickories lay the foundation for awesome squirrel hunting. Late-season squirrels spend time on the ground foraging for whatever remains of autumn, providing ample shots. Finding a den tree on the slopes will improve odds. Den trees can house several squirrels at a time but it may take a few hunts to figure out which trees are actual den trees. Once a tree is located, hunters should set up within range and stay as still as possible. Let the first squirrel out then shoot the second, but hold your ground! Other shots should appear. Dogs can be used for squirrel hunting for a week in October and during the whole month of February. Use of dogs is limited to the south tract only. If your freezer is full, and the ducks are not flying, take a kid to Tunica Hills and enjoy some late season squirrel action.